Mark Chapman has been busy translating our Python web scraping tutorials into Ruby. 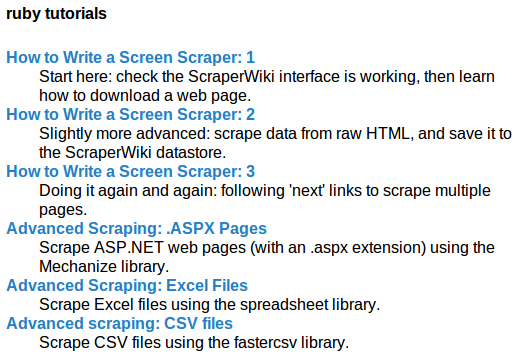 They now cover three tutorials on how to write basic screen scrapers, plus extra ones on using .ASPX pages, Excel files and CSV files. We’ve also installed some extra Ruby modules – spreadsheet and FastCSV – to make them possible. These Ruby scraping tutorials are made using ScraperWiki, so you can of course do them from your browser without installing anything.